Liquid Instruments - Moku:Lab Hardware . Measure more with less. Moku:Lab is a reconfigurable hardware platform that combines the digital signal processing power of an FPGA with versatile analog inputs and outputs. This simplifies your workflow by giving you access to 12 high-performance instruments that enable you to measure what you need when you need. Moku:Lab transforms into one of twelve instruments. Replace multiple pieces of equipment with a single device at a fraction of the cost. Moku:Lab’s analog frontend is designed for maximum versatility. Its two 500 MSa/s inputs can be configured for AC or DC coupling, 50 Ω or 1 MΩ impedance and an input voltage range of 1 Vpp or 10 Vpp. Moku:Lab also features two 1 GSa/s outputs with 300 MHz anti-aliasing filters, allowing you to generate two high-precision waveforms whilst measuring on its inputs. Moku:Lab can receive over-the-air software updates, bringing new features to existing instruments, and giving you access to entirely new instruments. When you buy a Moku:Lab, it’s just the beginning. With Moku:Lab, you’re not tethered to your equipment. Control your experiment wirelessly and move freely throughout the lab with your measurements at your side. Connect Moku:Lab to an existing WiFi network or configure it to create its own wireless network. It’s up to you. Connect to a wired network via Moku:Lab’s 100 Mbps Ethernet port. This is a great option in environments with a large number of network connected devices or WiFi congestion. It is also possible to connect to Moku:Lab via USB, allowing you to make full use of the iPad App even in WiFi restricted environments. Moku:Lab features an ultra-stable internal oscillator with better than 500 ppb accuracy, as well as 10 MHz input and output references for synchronization with external timebases. Moku:Lab features a dedicated DC to 5 MHz external trigger input designed for TTL (1.8 to 5 Volts) voltages. Some instruments (e.g., the Arbitrary Waveform Generator) use Moku:Lab’s analog inputs as high-precision external triggers, giving you more control over your system’s trigger settings.  It is impossible to resolve spectral features below the input voltage noise-floor. Calculated based on peak-to-peak ’code noise’ at the output of the ADC with terminated inputs. Units are Least Significant Bits (LSBs). Cross-talk is caused by the coupling of electro-magnetic radiation from one conducting element (wire) to another. The wires in electronic circuits act as antennas.